As a gardener, I am distressed to learn about droughts, floods in our country and the world, especially in areas known for their food production. Natural disasters in these areas can bring higher prices in grocery stores, creating economic problems for those on low or fixed incomes. As a gardener, I want to be able to help everyone have access to fresh fruits and vegetables. And as a gardener, I want to my garden to produce the biggest, best yield possible. And so I am now on a quest to do just that, documenting my results from week to week, month to month, this year and next, and so on. 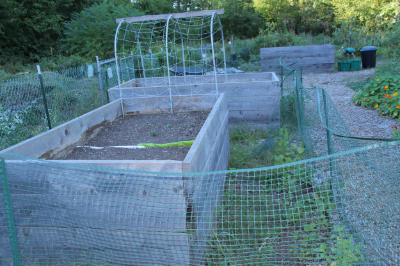 I garden in two raised beds, 4 x 8 ft., at the South Hadley Community Garden. My two beds are across the path from the Food Pantry Garden, a 50 x 50 ft. area, managed by Master Gardener Sue Brouillette, her husband Len, and a dedicated staff that works so hard to grow food for the South Hadley Food Pantry. I see firsthand the hard work and sweat that goes into the garden. I wondered if I could find an approach to increase the production of her garden and my own by increasing yield. I didn’t want to experiment with planting a larger area and working harder, but by using cultural methods, along with quality seeds, to increase yield of the crops we already plant. I wondered how to go about this. I had been told that Alpaca manure really improves the soil and results in abundant plant growth. I really wanted to know if alpaca manure is better than cow manure at improving the harvest, so the experiment was launched. April 27, 2015 was an overcast day with a slight wind and temperature of 49°F. I started turning the soil in the beds and adding the compost, new soil with 10-10-10 fertilizer, and the manure. The control for this experiment was that the soil in both beds was prepared using the same compost, fertilizer and soil. I divided each bed in half and added Rockwood Farms cow manure to one half, and naturally composted Tall Grass Alpaca Farm (Whately MA) alpaca manure to the other. I took the alpaca manure from the same pile and divided it between the two beds. I used 20 lbs. of each type of manure for each section of the beds. All the amended soil was prepared on the same day and worked into both beds. The working soil was six inches deep over the existing soil in the beds. I watered the soil and allowed it to rest for two days before planting anything. I planted each crop spanning the length of the bed with half of each crop in each type of manure. In Bed A (left), I planted Tennis Ball lettuce seeds from the Livingston Seed Company, hybrid spinach, Kookaburra, from Johnny’s Selected Seeds. From Burpee seeds, I planted Ruby Glow hybrid lettuce, and Dragon variety carrots, from Seed Savers Exchange, with space between and within rows for growth. In Bed B (right), I planted romaine lettuce, Truchas, from Johnny’s Selected Seeds, Avon hybrid spinach and Salad Bowl lettuce from Burpee, and Burpee Cherry Giant radishes. After harvesting the radishes, I planted sweet potatoes. In other planters that were not part of this experiment, I placed flowers, English Lavender, Marigold’s, and petunias along with Canna’s and coleus for additional color and attracting pollinators. Other non-experimental containers held tomato, corn, and green pepper plants. I watered by hand around the base of the plants, not on the leaves. By watering this way I am not encouraging bugs, fungi or pathogens to my garden. The surface of my garden usually looks dry and I use a moisture meter to check on the moisture of the soil beneath the surface to see if the roots are getting enough water, or to tell me if I over-watered. One of the best ways to improve yield is to harvest often to encourage the plants to keep producing. I harvested at least once a week and sometimes more, especially for the lettuce and spinach. I recorded is what I picked and weighed. Now for the results: Bed A, yielded 24.42 lbs., with Bed B yielding 23.55 lbs., not a significant difference in my assessment. * However, I did discover more weed seeds on the Alpaca manure side of each bed. I think this is because the alpaca manure is less processed than the bagged cow manure. When comparing each type of seed. I found that some vegetables preferred the cow manure over the alpaca and others didn’t seem to have a preference. The Tennis Ball lettuce seemed to perform better in the alpaca manure, but in the end, the results were almost equal. I consider this year’s numbers to be my baseline, and will repeat this experiment next summer to see if I can improve on the yields. *During the experiment, I sustained an eye injury requiring surgery that kept me out of the garden for about six weeks. I had planted cucumbers, lemon cucumbers, green and yellow beans intended to be part of this experiment, but I was not there for most of the harvest of these vegetables, and ultimately did not include them in the experiment. I am thankful to Sue Kelsey for taking care of the garden while I was out.